The Bureau of Land Management (BLM) often navigates complex interactions with the news media and sought training in order to maximize effectiveness. Gordley partnered with Dubek Media to provide full-day media training sessions for senior BLM technical and public affairs staff with media contact responsibilities in five locations across Arizona and southern Utah. The emphasis was on preparing BLM staff to interact with reporters while staying on message. As part of the training, participants received tools and techniques to communicate more effectively and deal with the pressure of difficult interview situations, as well as practice in front of the camera. 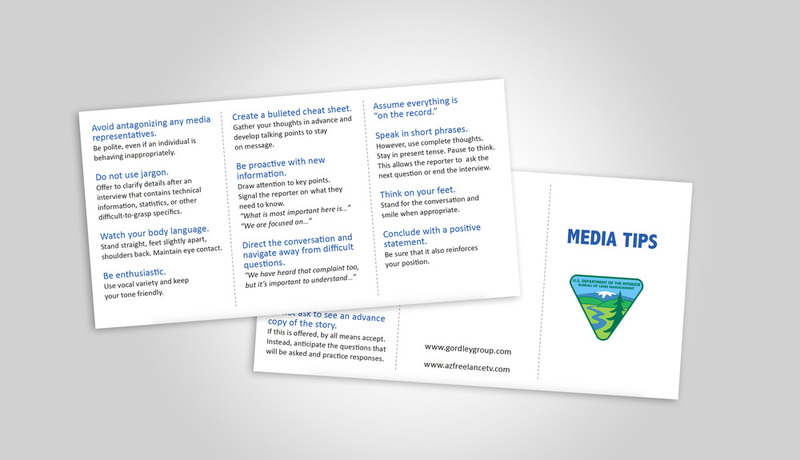 From how to dress and body language, to media coaching and pocket tip sheet, our team provided key strategies for preparing for media interaction. Participants raved about the usefulness of our team’s training techniques.